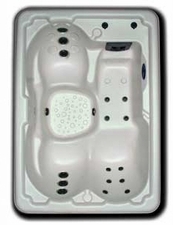 It's been more than a decade since the traditional 5'x7' spa has been affordable to consumers. 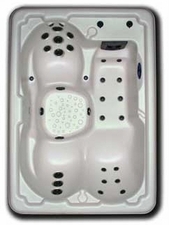 Due to many factors within the industry the 2-3 seater's cost became very similar with the more common 6'x6' or even 7'x7' spas. People then selected the larger spa even though a small intimate tub was originally desired. The NEW Aurora series from Viking is now a great selection for those couples or individuals looking for a more private tub at a great value! For the Aurora II we've almost doubled the amount of jets and increased the horsepower from 2 to 4. The Aurora II has a jet for almost every part of your body! For those looking for ultimate therapy in an intimate setting this spa is right for you. 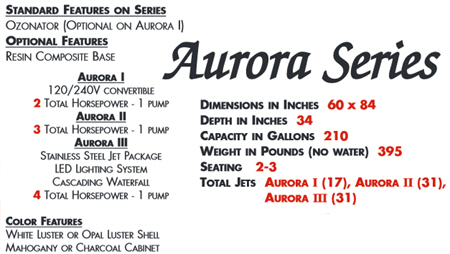 All of the Aurora IIs features with just a few extras to make your spa experience a little more gratifying. We've lit this model up with 24-brilliant points of LED Lights for an unbelievable nighttime. Along with stainless steel jets the Aurora III dazzles the eyes.